Situated on the Turkish Aegean coast, the Izmir region is home to Turkey's second- largest harbour. 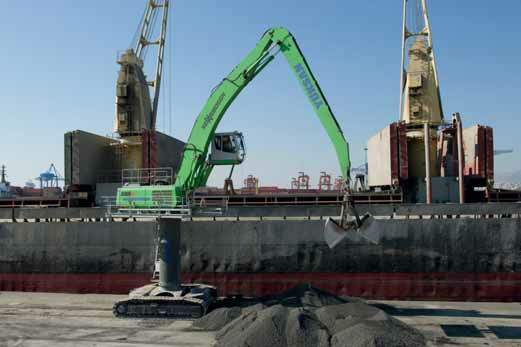 Here the company,Yüksan & Prolojistik Ltd, relies on SENNEBOGEN materials handling machines for demanding port handling. Recently a new 835 R of the E-series has been loading and unloading the arriving ships in a significantly shorter time than was previously possible. With the new SENNEBOGEN 835 R special, which was placed in service in mid-2013 at Prolojistik, the Turkish Sales and Service Partner, Forsen Material Handling, was able to place an additional crawler-driven materials handling machine in Turkey. With 224kW drive power and 8.9 l cubic displacement, the 835 R of the current E-series is impressive due to its high level of operational readiness and optimum reliability. Equipped with a 3m3 double shell grab, the machine unloads the arriving ships. Bulk goods of all types, from animal feed to ore, are loaded onto trucks. The SENNEBOGEN 835 R handles approximately four cycles per minute, up to 5,000 tonnes per day. Thus today the company handles just as much material as it handled previously with a significantly larger predecessor machine. For the operator the cab adjustment of the comfortable Maxcab, which can be elevated 3m and moved forward 2.6m, offers an ideal overview of the work environment. Together with the 4.5 pipe pylon this brings the operator to a convenient viewing height of approximately 9m. Particularly for unloading ships the operator always has a free view into the cargo bay of the ship. The special materials handling equipment, consisting of a 10.8m banana boom and a 9.4m gripper stick, is also configured especially for the demanding port handling application. Equipped with a particularly robust and wide gauge undercarriage with 700mm track shoes, the SENNEBOGEN 835 R is not only extremely safe it can also be moved flexibly along the quay. Here safety is written in capital letters. The perimeter uppercarriage railing and additional walkways offer ideal service and maintenance conditions. As a machine of the current E-series the 835 R is equipped with the SENNEBOGEN Control System, SENCON. The system supports the operator in daily operation, and in addition to idle stop automation, also offers custom fine adjustment and real-time analysis of an extensive range of machine parameters.